The beginning of Blue Devils' 2004 "Summer Train Blues Mix" was inspired by Eric Whitacre's "Ghost Train Triptych," with the sound of a train starting up and rolling out of the train yard to the clanking of sledgehammers against rail spikes (heard in the front ensemble and seen in the color guard as the rifles were brought down with force upon the spikes). The brass section then kicked the show into high speed, nailing a series of instrumental jabs as if picking up the sledgehammer-against-spikes theme. This was the year that the use of amplification in the front ensemble became legal in DCI competitions. Blue Devils jumped into the use of the new electronics in a big way and developed the first self-contained system that relied on individually miked instruments as opposed to a centralized system, eliminating cords sitting on the ground. As explained by the corps' front ensemble arranger Mike Nevin, every pit drum was miked, including a large Brazilian surdo drum (that created the effect of a train starting up and slowing down) and an udu drum, (a clay drum that otherwise would never be heard). Eight mallet keyboards were amplified in such a manner, as well as the timpani. The journey was more a journey through blues than it was a journey on a train, but it was the train that led us up the Mississippi River from New Orleans and into cities such as St. Louis and Kansas City, where blues wasn't a form of expression as much as a way of life. The screeching trumpet intro of "Blues in the Night" led into a smoking hot segment with the guard section spinning as furiously as the wheels of the train. After all that runaway excitement, the train came to a stop for refueling to Gershwin's "Summertime." It was here that drum corps got its first udu feature. The exotic sound helped make the piece all the more memorable. This was one of the most beautiful pieces on the field in 2004—the corps allowed it to breathe and fully develop, which greatly added to its mesmerizing effect. 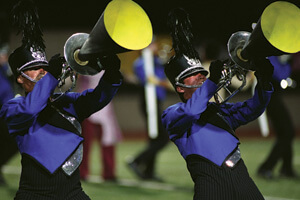 Performance excerpt of the 2004 Blue Devils. Afterward, the color guard verbally created the sound of the train's air brakes releasing, and then the train was once again in motion, with the front ensemble creating the sound of the train picking up steam with the accelerating sound of brushes amplified against the rough head of a large drum to replicate the sound of a locomotive pulling the cars from a dead stop, the chiming of a railroad crossing signal and a rail suspended from a mount clanging against the metal support. A number of mid-voice horns picked up megaphones to create a Doppler Effect inspired train whistle coming near and then going away as drums threatened to tear the tracks apart and brass players accelerated to the point of almost being thrown off the curve in the track heading into "Take the 'A' Train." The show wasn't over yet, as snippets from earlier moments came back one last time and the corps headed off into the distance. For the World Champions Finals, a surprise was in store: The corps, which had always headed to and halted in the upper right corner of the field all season, turned and went straight into the lower right corner tunnel of the stadium, turning the stadium's entry point into a railroad tunnel. This week only, you can save on 2004 World Championship Audio and Video Performance Downloads on the DCI Fan Network. Buy the 2004 Blue Devils Video Performance Download. (Available this week only for $3.99. Regular price: $4.99.) Buy the Audio Performance Download bundle of all 12 Finalists from 2004. (Available this week only for $15.99. Regular price: $19.99.) Offer ends Monday, June 13 at 8:30 a.m. ET.